When Pierre Casiraghi marries Beatrice Borromeo tomorrow, we probably won't see any significant jewels on the bride -- after all, Saturday's wedding will only be their civil ceremony, with a casual garden party at the palace to follow. Even so, the jewel vaults at the Prince's Palace include some wonderful pieces. Here's my list of the top ten best jewels from Monaco's princely collection. This diamond and ruby tiara was Princess Grace's wedding present from the Société des Bains de Mer. SBM is one of the most important financial groups in Monaco; they operate the casino and the opera in Monte Carlo, plus the Hotel de Paris. The tiara was made by Cartier. The rubies and diamonds echo the red and white colors of the Monegasque flag, lending the tiara a bit of patriotic flair. 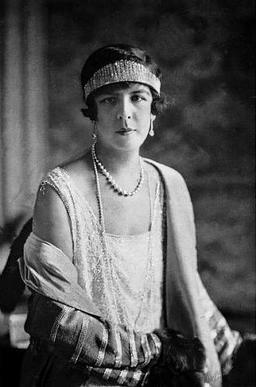 Above, Grace wears the tiara with her Cartier diamond necklace (#6 below) at a state banquet in France. Princess Grace wasn't the only Cartier fan in the Grimaldi family. A generation before, her mother-in-law, Princess Charlotte, was a frequent patron of the firm. Among her Cartier treasures is a demi-parure of diamonds and cabochon sapphires, which includes a necklace and coordinating earrings. After Prince Albert II proposed to Charlene Wittstock, he began commissioning a set of bejeweled wedding presents for his princess-to-be. Among these was a demi-parure of jewels by Van Cleef and Arpels. The "Ocean" suite consists of a convertible tiara/necklace and a matching pair of dramatic earrings. Charlene wore the earrings (pictured above) at the Rose Ball in 2014; she previously wore them in Paris in 2012. Just after her wedding, Charlene wore the necklace at the 2011 Rose Ball. The necklace clearly shows the design elements of the suite: circular elements set with diamonds and sapphires, designed to mimic ocean waves. The maritime theme honors Charlene, who was an Olympic swimmer. Charlene hasn't worn the tiara in public yet, but she's posed for pictures in the piece at least twice: for a portrait that hangs in the Van Cleef and Arpels store in Monte Carlo, and on the cover of Hola! magazine. Another good look at the tiara displayed at an exhibition can be seen here. You can see the cushion-cut earrings on Charlotte in the portrait above, which dates to the 1920s. Another piece of jewelry made by Cartier for Princess Grace, her three-stranded diamond necklace, is absolutely magnificent. Round diamonds are dispersed amid geometric baguettes, making the necklace both delicate and architectural. You can see Grace wearing the necklace with the Bains de Mer Tiara in #10 above and with her diamond tiara in #3 below. Since Grace's death, the necklace has been displayed in multiple exhibitions. The image with the dark gray background above shows the necklace in Madrid in 2012; the image with the red background shows the necklace in Antwerp in 2008. The necklace was also one of the pieces recreated by Cartier for the Nicole Kidman biopic of Grace's life, Grace of Monaco. Prince Albert proposed to Princess Charlene with an engagement ring made by Repossi. The impressive ring features a three-carat pear-shaped diamond as the center stone. Smaller diamonds cascade down the sides of the band, which is made of gray gold. Charlene doesn't often wear her ring in public, but it made a rare appearance recently during Albert's jubilee celebrations. Another of Charlene's wedding presents was the diamond aigrette made for her by Lorenz Bäumer. The piece is designed to look like the spray of a crashing wave -- yet another "water" jewel for the swimming princess of a seaside principality. In the video above, Bäumer discusses the design and construction of the headpiece. When she attends major gala events, Princess Caroline often wears a gorgeous diamond fringe necklace. It's said sometimes that the piece belonged to her grandmother, Princess Charlotte, and indeed, Caroline wore the necklace with Charlotte's Art Deco earrings at the Rose Ball in 2015. Here's another look at that '20s-era portrait of Princess Charlotte. 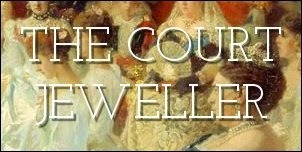 Many argue that Caroline's necklace is the same piece as the tiara russe worn by Charlotte above. After close examination of the necklace, however, I would argue that either a) they're not the same piece, or b) the necklace has undergone serious, serious renovations over time. My lengthy post on the subject can be found over here. The grandest piece of Grimaldi jewelry by Cartier takes the number one spot on my list: the grand diamond and pearl tiara made by Cartier for Princess Charlotte in 1949. Charlotte wore the tiara during the wedding festivities for her son, Prince Rainier, who married Grace Kelly in 1956. Which Grimaldi jewels make your top ten list?